Excited by the return of Savitar? What would you like to see happen in the episode? Share your thoughts below! This entry was posted in Media and tagged Flash TV Show 2014 on February 28, 2017 by Lia. “There’s always another way.” That theme keeps coming through in this episode, and it makes “Attack on Central City” much more than just a battle with Grodd…even though the battle WAS fantastic! Grodd has used Gypsy’s abilities to bring an entire gorilla army to Earth One, with the singular goal of turning Central City into a wasteland! Can Barry find “another way” to defeat Grodd? Want to know more? Just follow us after the jump! 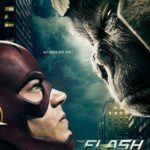 This entry was posted in Reviews and tagged Gorilla Grodd, Grodd, Gypsy, Harry Wells, HR Wells, Jesse Quick, Review, The Flash on February 28, 2017 by Ed Garrett. The CW has released the official still images from next week’s episode of The Flash, titled “Attack On Central City”. In the image above, you can see Accelerated Man (played by Sean Poague), who is the Flash of Earth-19. It seems like he may be assisting Team Flash against Grodd’s invasion, and one wonders if he’ll be interacting with H.R., who is native to that world. Accelerated Man is from the comics, though he’s only appeared in The Multiversity #2 and The Multiversity Guidebook by Grant Morrison. You can see the rest of the stills of Cisco, Gypsy, H.R. and more, at CBR. Just for fun, here’s the poster created by the CW for “Attack On Central City”. You’ve got to love the pun and that beautifully-rendered image of Grodd. And finally, here’s the official synopsis for the March 14th episode, titled “Into the Speed Force”. The Flash 3×16 “Into the Speed Force”: “BARRY TURNS TO THE SPEED FORCE – Desperate to stop Savitar and save his friends, Barry (Grant Gustin) turns to the speed force for answers. H.R. (Tom Cavanagh) gives Jesse (guest star Violett Beane) some advice. Gregory Smith directed the episode written by Brooke Roberts & Judalina Neira (#316).” The Flash season 3 airs Tuesdays at 8PM on the CW. “Into the Speed Force” airs March 14. Looking forward to more Grodd and the debut of Accelerated Man? Let us know your thoughts! This entry was posted in Media and tagged Flash TV Show 2014 on February 25, 2017 by Lia. DC has posted the cover for the last issue of the upcoming Flash–Batman crossover, and it’s another big one. 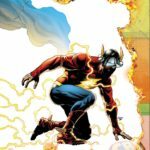 As reported by CBR, Jay Garrick is apparently back as of Flash #22. This image is part of a lenticular cover by Jason Fabok. Jay has been in the Earth-2 book since the early days of the post-Flashpoint era, where he’d been youthfully de-aged and was no longer the elder statesman readers had become so familiar with. But that series ends next month, and people had been hoping he’d return to the main DCU. It’s not clear what version of Jay we’ll be seeing in the upcoming crossover, but his uniform (and helmet!) is much more reminiscent of pre-Flashpoint Jay than the one in the Earth-2 book. Looking forward to the return of Jay? What do you hope to see done with him, and potentially with the JSA? Share your thoughts! This entry was posted in Flash News on February 24, 2017 by Lia. Captain Cold appears to have The Flash just where he wants him. 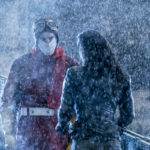 Len Snart’s ability to take apart and reverse engineer technology has just been taken up a notch, and the Rogues may finally be able to defeat their long-time nemesis. What comes next? 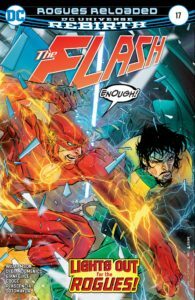 A truly excellent issue of THE FLASH, that’s what! Want to know more? Follow us after the jump! This entry was posted in Reviews and tagged Captain Cold, Review, Rogues Gallery, The Flash on February 23, 2017 by Ed Garrett. Here’s the extended trailer for next week’s episode of The Flash, titled “Attack on Central City”. It’s the second half of the two-part episode with Grodd, and the title’s fairly self-explanatory. Looking forward to seeing how it all ends? What are your hopes or predictions for the episode? This entry was posted in Media and tagged Flash TV Show 2014 on February 21, 2017 by Lia.